Louis-Philippe, King of the French, was the eldest son of Louis Philip Joseph, duke of Orleans (known during the Revolution as Philippe Egalité) and of Louise Marie Adelaide de Bourbon, daughter of the duc de Penthièvre, and was born at the Palais Royal in Paris on the 6th of October 1773. On his father's side he was descended from the brother of Louis XIV, on his mother's from the count of Toulouse, "legitimated" son of Louis XIV and Madame de Montespan. The legend that he was a supposititious child, really the son of an Italian police constable named Chiapponi, is false. The godparents of the duke of Valois, as he was entitled until 1785, were Louis XVI and Marie Antoinette; his governess was the famous Madame de Genlis, to whose influence he doubtless owed many of the qualities which later distinguished him: his wide, if superficial knowledge, his orderliness, and perhaps his parsimony. Known since 1785 as the duc de Chartres, he was sixteen at the outbreak of the Revolution, into which -- like his father -- he threw himself with ardor. In 1790 he joined the Jacobin Club, in which the moderate elements still predominated, and was assiduous in attendance at the debates of the National Assembly. He thus became a persona grata with the party in power; he was already a colonel of dragoons, and in 1792 he was given a command in the army of the North. As a lieutenant-general, at the age of eighteen, he was present at the cannonade of Valmy (September 20) and played a conspicuous part in the victory of Jemappes (November 6). The republic had meanwhile been proclaimed, and the duc de Chartres, who like his father had taken the name of Egalité, posed as its zealous adherent. Fortunately for him, he was too young to be elected deputy to the Convention, and while his father was voting for the death of Louis XVI he was serving under Dumouriez in Holland. He shared in the disastrous day of Neerwinden (March 18, 1793); was an accomplice of Dumouriez in the plot to march on Paris and overthrow the republic, and on the 5th of April escaped with him from the enraged soldiers into the Austrian lines. He was destined not to return to France for twenty years. He went first, with his sister Madame Adelaide, to Switzerland where he obtained a situation for a few months as professor in the college of Reichenau under an assumed name, mainly in order to escape from the fury of the émigrés. The execution of his father in November 1793 had made him duke of Orleans, and he now became the center of the intrigues of the Orleanist party. In 1795 he was at Hamburg with Dumouriez, who still hoped to make him king. With characteristic caution Louis Philippe refused to commit himself by any overt pretensions, and announced his intention of going to America; but in the hope that something might happen in France to his advantage, he postponed his departure, travelling instead through the Scandinavian countries as far north as Lapland. But in 1796, the Directory having offered to release his mother and his two brothers; who had been kept in prison since the Terror, on condition that he went to America, he set sail for the United States, and in October settled in Philadelphia, where in February 1797 he was joined by his brothers the duc de Montpensier and the comte de Beaujolais. Two years were spent by them in travels in New England, the region of the Great Lakes, and of the Mississippi; then the news of the coup d'état of 18 Brumaire decided them to return to Europe. They returned in 1800, only to find Napoleon Bonaparte's power firmly established. Immediately on his arrival, in February 1800, the duke of Orleans, at the suggestion of Dumouriez, sought an interview with the comte d'Artois, through whose instrumentality he was reconciled with the exiled king Louis XVIII, who bestowed upon his brothers the order of the Saint Esprit. The duke, however, refused to join the army of Condé and to fight against France, an attitude in which he persisted throughout, while maintaining his loyalty to the king. He settled with his brothers at Twickenham, near London, where he lived until 1807 -- for the most part in studious retirement. On the 18th of May 1807 the duc de Montpensier died at Christchurch in Hampshire, where he had been taken for change of air, of consumption. The comte de Beaujolais was ill of the same disease and in 1808 the duke took him to Malta, where he died on the 29th of May. The duke now, in response to an invitation from King Ferdinand IV, visited Palermo where, on the 25th of November 1809 he married Princess Maria Amelia, the king's daughter. He remained in Sicily until the news of Napoleon's abdication recalled him to France. He was cordially received by Louis XVIII; his military rank was confirmed, he was named colonel-general of hussars, and such of the vast Orleans estates as had not been sold were restored to him by royal ordinance. The object may have been, as M. Debidour suggests, to compromise him with the revolutionary parties and to bind him to the throne; but it is more probable that it was no more than an expression of the goodwill which the king had shown him ever since 1800. The immediate effect was to make him enormously rich, his wealth being increased by his natural aptitude for business until, after the death of his mother in 1821, his fortune was reckoned at some £8,000,000. Meanwhile, in the heated atmosphere of the reaction, his sympathy with the Liberal opposition brought him again under suspicion. His attitude in the House of Peers in the autumn of 1815 cost him a two years' exile to Twickenham; he courted popularity by having his children educated en bourgeois at the public schools; and the Palais Royal became the rendezvous of all the leaders of that middle-class opinion by which he was ultimately to be raised to the throne. His opportunity came with the revolution of 1830. During the three "July days" the duke kept himself discreetly in the background, retiring first to Neuilly, then to Raincy. Meanwhile, Adolphe Thiers issued a proclamation pointing out that a Republic would embroil France with all Europe, while the duke of Orleans, who was "a prince devoted to the principles of the Revolution" and had "carried the tricolor under fire" would be a "citizen king" such as the country desired. This view was that of the rump of the chamber still sitting at the Palais Bourbon, and a deputation headed by Thiers and Laffitte waited upon the duke to invite him to place himself at the head of affairs. He returned with them to Paris on the 30th, and was elected by the deputies lieutenant-general of the realm. The next day, wrapped in a tricolor scarf and preceded by a drummer, he went on foot to the Hôtel de Ville -- the headquarters of the republican party -- where he was publicly embraced by Lafayette as a symbol that the republicans acknowledged the impossibility of realizing their own ideals and were prepared to accept a monarchy based on the popular will. Hitherto, in letters to Charles X, he had protested the loyalty of his intentions, and the king now nominated him lieutenant-general and then, abdicating in favor of his grandson Henri, Comte de Chambord appointed him regent. On the 7th of August, however, the Chamber by a large majority declared Charles X deposed, and proclaimed Louis Philippe "King of the French, by the grace of God and the will of the people." The career of Louis Philippe as King of the French is that of the history of France. Here it must suffice to note something of his personal attitude towards affairs and the general effects which this produced. For the trappings of authority he cared little. To conciliate the revolutionary passion for equality he was content to veil his kingship for a while under a middle-class disguise. He erased the royal lilies from the panels of his carriages; and the Palais Royal, like the White House at Washington, stood open to all and sundry who cared to come and shake hands with the head of the state. This pose served to keep the democrats of the capital in a good temper, and so leave him free to consolidate the somewhat unstable foundation of his throne and to persuade his European fellow-sovereigns to acknowledge in him not a revolutionary but a conservative force. But when once his position at home and abroad had been established, it became increasingly clear that he possessed all the Bourbon tenaciousness of personal power. When a "party of Resistance" came into office with Casimir-Périer in March 1831, the speech from the throne proclaimed that "France has desired that the monarchy should become national, it does not desire that it should be powerless"; and the migration of the royal family to the Tuileries symbolized the right of the king not only to reign but to rule. Republican and Socialist agitation, culminating in a series of dangerous risings, strengthened the position of the king as defender of middle-class interest; and since the middle classes constituted the pays légal which alone was represented in Parliament, he came to regard his position as unassailable, especially after the suppression of the risings under Blanqui and Barbès in 1839. Little by little his policy, always supported by a majority in a house of representatives elected by a corrupt and narrow franchise, became more reactionary and purely dynastic. His position in France seeming to be unassailable, he sought to strengthen it in Europe by family alliances. The fact that his daughter Louise was the consort of Leopold I, King of the Belgians, had brought him into intimate and cordial relations with the English court, which did much to cement the entente cordiale with Great Britain. Broken in 1840 during the affair of Mehemet Ali the entente was patched up in 1841 by the Straits Convention and re-cemented by visits paid by Queen Victoria and Prince Albert to the Chateau d'Eu in 1843 and 1845 and of Louis Philippe to Windsor in 1844, only to be irretrievably wrecked by the affair of the "Spanish marriages", a deliberate attempt to revive the traditional Bourbon policy of French predominance in Spain. 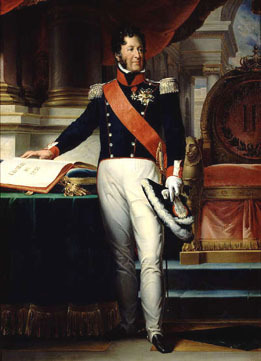 If in this matter Louis Philippe had seemed to sacrifice the international position of France to dynastic interests, his attempt to re-establish it by allying himself with the reactionary monarchies against the Liberals of Switzerland finally alienated from him the French Liberal opinion on which his authority was based. When, in February 1848, Paris rose against him, he found that he was practically isolated in France. Charles X, after abdicating, had made a dignified exit from France, marching to the coast surrounded by the cavalry, infantry and artillery of his Guard. Louis Philippe was less happily situated. Escaping with the queen from the Tuileries by a back entrance, he made his way with her in disguise to Honfleur, where the royal couple found refuge in a gardener's cottage. They were ultimately smuggled out of the country by the British consul at Havre as Mr. and Mrs. Smith, arriving at Newhaven "unprovided with anything but the clothes they wore." They settled at Claremont, placed at their disposal by Queen Victoria, under the incognito of count and countess of Neuilly. Here on the 26th of August 1850, Louis Philippe died. The character of Louis Philippe is admirably traced by Queen Victoria in a memorandum of May 2, 1855, in which she compares him with Napoleon III. She speaks of his "vast knowledge upon all and every subject", and "his great activity of mind." He was, unlike Napoleon, "thoroughly French in character, possessing all the liveliness and talkativeness of that people." But she also speaks of the "tricks and over-reachings" practiced by him, "who in great as well as in small things took a pleasure in being cleverer and more cunning than others, often when there was no advantage to be gained by it, and which was, unfortunately, strikingly displayed in the transactions connected with the Spanish marriages, which led to the king's downfall, and ruined him in the eyes of all Europe" (Letters, III, 122). Louis Philippe had eight children. His eldest son, the popular Ferdinand Philippe, duke of Orleans, who had married Princess Helena of Mecklenburg, was killed in a carriage accident on the 13th of July 1842, leaving two sons, the comte de Paris and the duc de Chartres. The other children were: Louise, consort of Leopold I of Belgium; Marie, who married Prince Alexander of Württemburg and died in 1839; Louis Charles, duc de Nemours; Clementine, married to the duke of Coburg-Kohary; François Ferdinand, prince de Joinville; Henri Eugène, duc d'Aumale; Antoine Philippe, duc de Montpensier, who married the Infanta, younger sister of Queen Isabella of Spain.